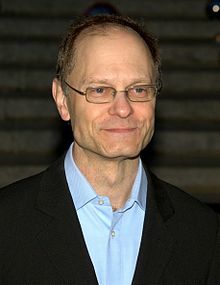 David Hyde Pierce (born April 3, 1959) is an American actor and director. He is best known for playing psychiatrist Dr. Niles Crane on the NBC sitcom Frasier, for which he won four Primetime Emmy Awards for Outstanding Supporting Actor in a Comedy Series during the show's run. Pierce has played supporting roles in many films, including Little Man Tate, The Fisher King, Sleepless in Seattle, A Bug's Life, and Oliver Stone's Nixon. Pierce has also had a successful career on stage. His Broadway roles include Sir Robin in Spamalot, Vanya in Vanya and Sonia and Masha and Spike and Horace Vandergelder in Hello Dolly. He won the 2007 Tony Award for Best Performance by a Leading Actor in a Musical for his performance in Curtains. In 2015, he directed the Broadway musical It Shoulda Been You. Pierce was born David Pierce in Saratoga Springs, New York. 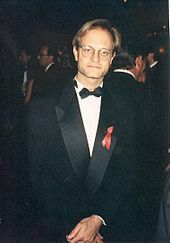 His father, George Hyde Pierce, was an aspiring actor, and his mother, Laura Marie (née Hughes), was an insurance agent. He added his middle name "Hyde" to avoid confusion with another actor named David Pierce. As a child, Pierce frequently played organ at the local Bethesda Episcopal Church. While attending Yale, Pierce performed in and directed student productions, appearing in the Yale Gilbert & Sullivan Society's production of H.M.S. Pinafore. He also directed the Gilbert & Sullivan Society's operetta Princess Ida. Among other productions Pierce appeared in at Yale were Waiting for Godot, Saint Joan, and Who's Afraid of Virginia Woolf?. In 2005, Pierce joined Tim Curry and others in the stage production of Spamalot. In August and September 2006, he starred as Lieutenant Frank Cioffi in Curtains, a new Kander and Ebb musical staged at the Ahmanson Theatre in Los Angeles. In March 2007, Curtains opened on Broadway and on June 10, 2007, Pierce won the Tony Award for Best Performance by a Leading Actor in a Musical at the 61st Tony Awards for his performance. In his acceptance speech, Pierce said the first words he spoke on a Broadway stage were, "I'm sorry, I'm going to have to ask you to leave." On November 19, 2007, Pierce was awarded an Honorary Doctor of Fine Arts Degree from Niagara University in Lewiston, New York. In 1999 he was awarded an Honorary Degree from Skidmore College, located in his native Saratoga Springs. In 2010, Pierce appeared in a revival of David Hirson's play La Bête directed by Matthew Warchus. The production debuted on London's West End before moving to New York. Also in 2010, Pierce had his first starring film role as Warwick Wilson in the dark comedy/psychological thriller The Perfect Host. Pierce appeared in the Off-Broadway limited engagement of A Life by Adam Bock. The play premiered at the Peter Jay Sharp Theater on October 24, 2016, directed by Anne Kaufman, and closed on November 27. Pierce co-starred with Bette Midler in the Broadway revival of Hello, Dolly!. The musical opened on April 20, 2017 at the Shubert Theatre. The show was a critical and box office hit. Pierce himself received a Tony Award nomination for Best Featured Actor in a Play for his performance. Pierce received a 2017 Drama League award nomination for Hello, Dolly! and A Life. Pierce is known for his distinctive voice and, like his Frasier co-star, Kelsey Grammer, is often called upon to provide voice work. His notable roles include the narrator of the movie The Mating Habits of the Earthbound Human in 1999, walking stick insect Slim in A Bug's Life, Doctor Delbert Doppler in Disney's film Treasure Planet, and the amphibian Abe Sapien in Hellboy. Pierce refused credit for his Hellboy role because he felt it was the performance of Doug Jones, and not his own voice, which ultimately brought the character of Abe Sapien to life. He was the voice for Drix, a cold pill, in the animated comedy Osmosis Jones. In a deliberate in-joke, he voiced Cecil, the brother of Kelsey Grammer-voiced Sideshow Bob, in The Simpsons episode "Brother from Another Series", in which the two characters parallel the Frasier-Niles relationship. At one point in the episode, Cecil mistakes Bart for Maris, the unseen wife of Niles on Frasier. He returned as Cecil in the Season 19 episode "Funeral for a Fiend" where Frasier co-star John Mahoney voices Dr. Robert Terwilliger, Sr., the father of Cecil and Sideshow Bob. Pierce provided the voice of Mr. Daedalus in the 1998 Disney show Hercules: The Animated Series. In 2006, he co-starred in the animated pilot for The Amazing Screw-On Head as the Screw-On Head's nemesis Emperor Zombie; however, the series was not picked up. His commercial voiceover work included ads for the Tassimo coffee system, Seattle's Metro Transit, and home furnishings retailer Ikea Canada. Pierce narrated an audio tour guide, Napa Uncorked, in 2002. He is a godparent to Frasier co-star Jane Leeves' son, Finn, as was his late Frasier co-star John Mahoney. Pierce has spent years working with the Alzheimer's Association on behalf of Americans with Alzheimer's disease. He has appeared in Washington, D.C., to testify in support of expanding funding for treatment, and he publicly campaigned for the National Alzheimer's Project Act. Pierce told MSNBC in 2011, "it is up to us, to all of us, to the American people and to their representatives about whether we face the challenges and make all the effort necessary or if we ignore it and just let this sort of tidal wave crash over us." 1987 Spenser: For Hire O'Neill Episode: "The Man Who Wasn't There"
1987 Crime Story NSA Agent Carruthers Episode: "Mig 21"
1988 Knightwatch Gibson Episode: "Friday Knight"
1992 Dream On Jerry Dorfer Episode: "The Guilty Party"
1995 Saturday Night Live Himself (host) Episode: "David Hyde Pierce/Live"
1995 Caroline in the City Dr. Niles Crane Episode: "Caroline and the Bad Back"
1996 The Outer Limits Dr. Jack Henson Episode: "The Sentence"
1996 Caroline in the City Jimmy Callahan Episode: "Caroline and the Cat Dancer"
2001 Titus Jerry October Episode: "Life Forward"
2012 Sesame Street Commander Chiphead Episode: "Get Lost, Mr. Chips"
Episode: "Clown in the Dumps"
2017 Wet Hot American Summer: Ten Years Later Henry Newman Episode: "End Summer Night's Dream"
Pierce was nominated for 11 consecutive Emmy Awards winning 4. ^ a b "David Hyde Pierce profile". Rootsweb. 2008. Retrieved 2008-06-11. ^ a b "David Hyde Pierce". IMDb. ^ Barbara S Wilson, Arlene Flancher, and Susan T. Erdey, The Episcopal Handbook (Moorhouse [Church] Publishing 2008), pp. 106-7, ISBN 978-0-8192-2329-6. ^ The Broadway League. "Profile at IBDb". Ibdb.com. Retrieved 2011-10-28. ^ a b c d e f g h "Showperson; the DHP Website". Archived from the original on 2008-06-02. Retrieved 2008-06-19. ^ a b Newman, Bruce (1998-03-01). "All In Their Family". Los Angeles Times. Retrieved 2009-02-20. ^ "David Hyde Pierce Acceptance Speech Tony Award". YouTube. 2007. Retrieved 2010-06-03. ^ "Rylance, Lumley and Hyde Pierce bring La Bête to West End". London, UK. 2010. Retrieved 2010-07-27. ^ Jones, Doug (May 11, 2007). "Doug Jones – Exclusive Interview". Horror.com (transcript). Interviewed by Staci Layne. Retrieved 2008-06-11. ^ "IKEA Pax: Our Pre-Wedding Photographer Lives in Advertising". Youtube.com. 2011-06-08. Retrieved 2011-10-28. ^ DeBord, Matthew (December 7, 2002). "Frasier's David Hyde Pierce Leads CD Tour of Napa Wine Country". WineSpectator.com. Retrieved October 9, 2017. ^ The Associated Press (May 30, 2007). "'Frasier' brother finds home on stage". CNN. Archived from the original on 2007-06-29. Retrieved 2008-06-11. ^ "David Hyde Pierce joins list of out gay actors". AfterElton. May 30, 2007. Archived from the original on May 17, 2008. Retrieved 2008-06-11. ^ "Rants & Raves". The Advocate. July 17, 2007. pp. 26, issue 989. ^ "Frasier Star Reveals He Wed Boyfriend". US Magazine. May 29, 2009. Retrieved August 3, 2015. ^ "David Hyde Pierce reveals he's been secretly married to partner of 25 years". New York Daily News. May 29, 2009. Archived from the original on June 1, 2009. Retrieved 2009-05-30. ^ Mulkerrins, Jane (2011-02-13). "'People are stopping me in the street again! ': Actress Jane Leeves has struck sitcom gold again". Daily Mail. Retrieved 2011-03-20. ^ "David Hyde Pierce: Don't forget Alzheimer's – US news – Giving | NBC News". MSNBC. 2011-10-19. Retrieved 2014-06-10. ^ Oxman, Steven (June 10, 2001). "Review: 'Six Dance Lessons in Six Weeks'". Variety. Retrieved September 29, 2016. Wikimedia Commons has media related to David Hyde Pierce. Frasier is an American sitcom that was broadcast on NBC for 11 seasons, premiering on September 16, 1993, and concluding on May 13, 2004. The program was created and produced by David Angell, Peter Casey, and David Lee in association with Grammnet (2004) and Paramount Network Television. The series was created as a spin-off of Cheers, continuing the story of psychiatrist Frasier Crane as he returned to his hometown of Seattle and started building a new life as a radio advice show host while reconnecting with his father and brother and making new friends. Frasier stars Kelsey Grammer, Jane Leeves, David Hyde Pierce, Peri Gilpin, and John Mahoney. The show was critically acclaimed, with the show itself and the cast winning thirty-seven Primetime Emmy Awards, a record at the time for a scripted series. It also won the Primetime Emmy Award for Outstanding Comedy Series for five consecutive years. As of 2019, the possibility of a revival is being discussed. Charles John Mahoney was an English-American actor of stage, film, and television. Edward Hibbert is an Anglo-American actor and literary agent. He played Gil Chesterton in the TV series Frasier. He also voiced Zazu in both The Lion King II: Simba's Pride and The Lion King 1½, replacing Rowan Atkinson.